For as long as I can remember, my oldest son has been obsessed with pancakes. Since he learned to say the word, it’s a frequent mealtime request — and not just for breakfast. We’ve always used 100% maple syrup in our home, rather than the imitation stuff. The last few years, that’s meant stocking up at a local pancake breakfast during “Maple Season” here in Northeast Ohio. Since I use maple syrup for baking, too, it’s not unusual for us to purchase a whole gallon for the year. When I heard about Maple Sugaring Weekends at the Lake Metroparks Farmpark, I knew it would make for a great family excursion so my 3-year-old could learn where his favorite pancake topping comes from. Plus, with the playground, animal demonstrations and everything else there is to do at the Farmpark, it’s always worth the trip. Much of the maple sugaring activity is centered around the Farmpark’s Woodland Center and Plant and Science Center buildings. When we visited last Sunday morning, things were still heating up — literally — from frigid temperatures the night before. The evaporator wasn’t fired up yet because the pipes were still being thawed. But the friendly staff still did a great job explaining and showing how the process works. My son was amazed when one staffer scooped up a shovelful of amber liquid that had been boiled to midway between sap and syrup. Dozens of jugs hanging overhead demonstrated that it takes 40 gallons of sap to make just one gallon of maple syrup. And, of course, the maple candy and maple stirs available for purchase in the Woodland Center were a hit. Outside the building, staff members demonstrated the sap-to-syrup process using an outdoor fire, the way someone (with a plethora of sugar maple trees) would do it in their own backyard. We had baby brother in a stroller — and did I mention frigid temperatures? — so we didn’t take the trail into the sugar bush to watch how trees are tapped. 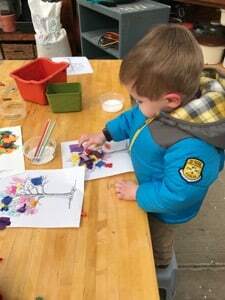 A short tractor-drawn wagon ride took us to the Plant and Science Center, where there are toys and hands-on exhibits for kids, plus special maple-themed crafts for the event. We spent a lot of time there, until lunchtime drew near and the pancake requests became more frequent. After a pancake lunch (with maple syrup, of course) at the Farmpark’s J&J Café and a stop at the gift shop, we headed home, giant jug of maple syrup in hand. Maple Sugaring Weekends will be held again March 11 and 12. Click here for more information. Equally as impressive as Maple Sugaring Weekends was the Quilts 2017 display, with more than 200 exhibits from national and regional quilters. Be sure to allow time to peruse the impressive quilts, which are displayed in the Visitor Center through March 29.